Scientists ask: Is climate change killing Montana’s harlequin ducks? 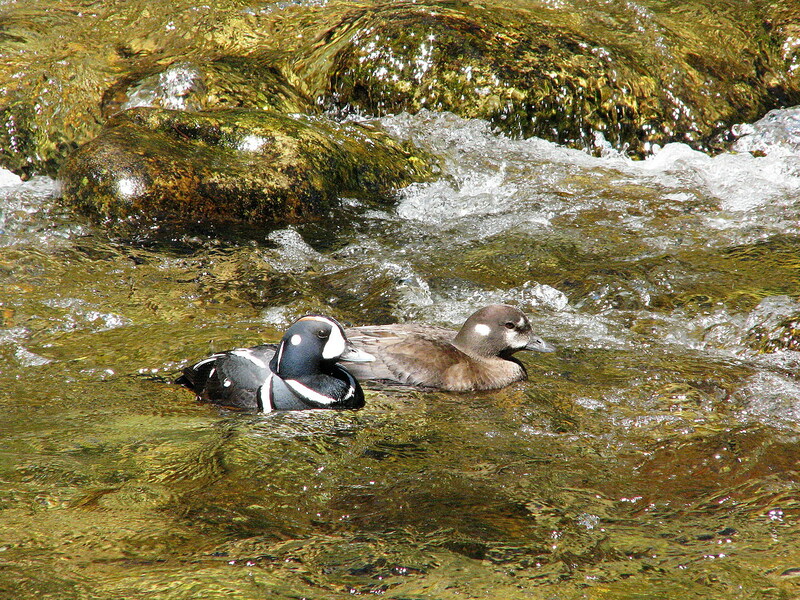 Like many tourists, harlequin ducks travel hundreds of miles every year to spend a little time in Montana. But their visits here, coupled with climate change, could be causing their numbers to decline. Montana Fish, Wildlife & Parks biologist Chris Hammond has been catching and tagging harlequin ducks for the past three years as part of an international study to learn why populations are decreasing. Hammond will outline the study and some early results during a Montana Wilderness Association lecture in Missoula Tuesday night. Biologists in Montana, Wyoming, Washington, and Alberta and British Columbia, Canada, are participating in a five-year effort to tag pairs of ducks to see where they go and what they do. In Montana, biologists are trying to tag ducks on streams northwest of Whitefish, in Glacier National Park, along the Rocky Mountain Front near Augusta and Choteau, and on the Boulder River near Big Timber. FWP did some duck surveys in the early 1990s, but 2015 was the first year of trying to do a statewide count. Biologists will turn out to do another in 2020. “We don’t have a really strong handle on populations in Montana. It’s hard when you have just snapshots every few years,” Hammond said. It’s easy to see why some wouldn’t want to lose this duck. With a name inspired by the diamond-patterned costume of a harlequin jester, the distinctive seabirds have striking coloration outlined in white: reddish sides, midnight blue necks splashed with two white lines, and black heads crowned with red and white and a white dot on the side. They also have an unusual life history. While the couples of most species rear their young together and some are known to mate for life, harlequin ducks stay together for only a short time each year. After wintering along the northern Pacific Coast, the ducks pair up and fly inland to streams in Alberta, Montana and Wyoming to mate. They usually start arriving in late April; Hammond and his crew have only about five or six weeks to trap and tag the ducks before the males return to the coast. The females are left to sit on the nest and rear their young until about September, when they too fly back, youngsters in tow. Six weeks isn’t a lot of time to catch pairs of ducks, and it’s not an easy process. Crews set up a mist net above a stream, and when ducks come near, the humans try to flush the birds into the net. Flush them too early and the ducks fly over the net; too late, and they just dive under the water. “It’s a learning curve and you need to be a serious harlequin duck whisperer,” Hammond said. As a result, FWP biologists have been able to tag only about 18 to 20 pairs of ducks with transmitters over three years. And not all the transmitters have worked as advertised. So this last tagging effort in May is important for increasing that number so the project has good data. Hammond already knows a few things. For instance, the ducks that mate in Montana fly from as far away as southeast Alaska. Glacier National Park biologist Lisa Bates does yearly brood surveys of ducklings and has noticed a disturbing trend of seeing more hens without broods in late summer. Last August, she saw 20 single hens with no ducklings. When each hen lays six to eight eggs, that’s a loss of about 180 ducklings from the population. Hammond said predation plays a role, but climate change may be assuming a bigger part. With the data Hammond and his colleagues are collecting, they hope to get a better idea of the threats to harlequin survival and how to counteract them. The free lecture will be at Opportunity Resources, 2821 S. Russell St. in Missoula, from 6:30-7:30 p.m. Tuesday.